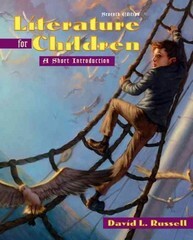 Literature for Children 7 Edition Literature for Children covers the full range of subjects typically addressed in children’s literature, while focusing on genres and concepts rather than on particular authors. The book’s concise, accessible, inviting style includes many specific illustrations and explanations as examples of the concepts presented and allows readers to spend more time reading the primary texts. Included are topics for consideration and discussion at the end of each chapter, many bibliographies of both scholarly resources and children’s books, an extensive glossary, a list of children’s literature research sources, and lists of children’s book awards, making the book an outstanding, useful resource.